This walk route has been revised to utilize part of a new section of trail that follows Sugarland Run within Herndon. It also utilizes a revised route through Runnymede Park to avoid a section of natural surface trail that has been partly washed out. To view the old walk that utilized an informal path near the Stuart Woods Apartments click on this link. For a map and directions suitable for printing click here. You will need Adobe Acrobat to view and print this material. You will find a link to this free software on the Contents Page. To view pictures of the trail construction click here. This is one of a series of walks in the Sugarland Run area. Sugarland Run closely follows the border between Reston and Herndon. Wiehle Avenue is the only road crossing between Elden Street and Leesburg Pike but there are many stream crossings for walkers. This joins the neighborhoods on both sides of the stream and there are many similarities in the system of paths and other amenities on both sides. This loop walk will take you through Runnymede Park in Herndon but starts in Reston. This walk crosses Sugarland Run and another stream on concrete columns. It is not suitable for handicapped access or for persons with a poor sense of balance. The columns are placed on a concrete ramp that crosses the stream underwater. Mud on the sloping ramp can be very slippery after it rains so be careful when approaching the columns. After a heavy downpour the stream can get quite high and flow over the tops of the columns. Normally, the stream is only a few inches deep at the crossings. 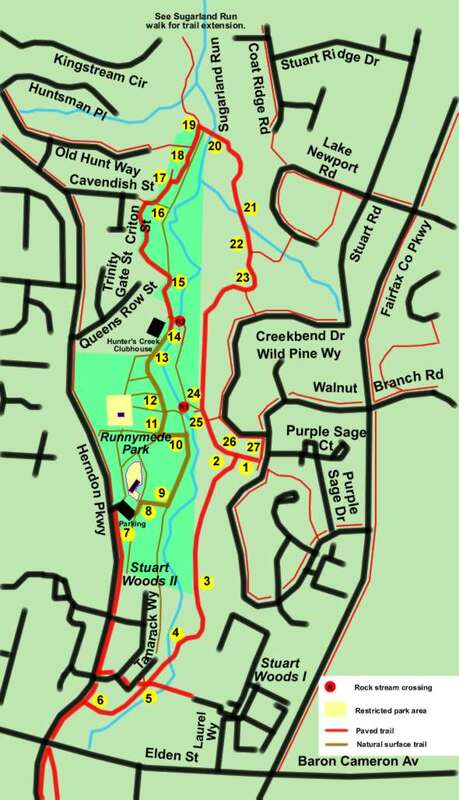 Click on points 20 and 21 on the map to view pictures of the crossings. The walk starts opposite Purple Sage Court on Walnut Branch Road. There is parking along the street at this location. Take the path away from Purple Sage Court going west. Note the utility box along the path in the picture. Turn left at the first asphalt trail. The trail quickly heads into the trees and houses will be seen on the left. There may be a ‘Trail Ends’ sign at the end of the Fairfax County portion of the path. From this point on you will be following a new part of the trail built by the town of Herndon. The trail utilizes a short section of boardwalk to cross a wet area. A short distance beyond the boardwalk the trail crosses Sugarland Run on a bridge.. The trail crosses 2 asphalt trails leading into the parking area on the right. Continue straight on the asphalt trail along the stream. After a short distance it will turn right just prior to a wooden fence. The trail intersects with Herndon Parkway. Turn right and follow the sidewalk along Herndon Parkway. Herndon Parkway will be on the left. Turn right at the driveway leading into Runnymede Park. Turn right onto the asphalt trail leading towards the picnic pavilion. The trail turns to the left prior to the pavilion. Turn right onto the asphalt trail next to the display area. Follow the asphalt trail into the woods. The houses in the park are occupied and are off limits to visitors. The asphalt ‘Woodland Path’ goes only a short distance through the woods when it intersects with ‘Sycamore Trail’ at a clearing. Turn left to follow that natural surface trail. It is also marked with a sign. Turn left at the first intersecting natural surface trail on the left. This should be marked as ‘Woodland Trail’. Turn right to follow the first intersecting natural surface trail on the right. This should be marked as ‘Redbud Path’. Continue straight across the next natural surface trail intersection. Also continue straight past other intersecting natural surface trails on the left. Redbud Path leaves the woods near the Hunter’s Creek Clubhouse. Continue straight towards the right of the building. A paved trail (marked as the Hunter’s Creek Trail) starts at the clubhouse. Follow it and pass the swimming pool on your left. Just pass the swimming pool is an asphalt trail to the right leading to another stream crossing where the bridge was washed out. Continue on the present trail. (The bridge used to carry the Sycamore Trail back across the creek to the clubhouse.) After a short distance the Hunter’s Creek Trail crosses a bridge. The trail crosses a side creek on a narrow bridge. A short distance later the asphalt trail turns left at the intersection with a natural surface trail (Redwing Trail) which is partially blocked by a gate. Continue to the left on the asphalt trail. An asphalt trail intersects from the left. Continue on the present trail to the right. Just beyond this a natural surface trail leads to the right to a gate. Stay on the asphalt trail to the left. The natural surface trail is marked as the ‘Cavendish Spur’. An asphalt trail leads to the left. It is a dead end so stay to the right. An asphalt trail leads to the left. It is marked as ‘Huntway Path’. Continue on the present trail. This is the last trail intersection in Runnymede Park. Turn right at the next asphalt trail connection. You are now in Fairfax County. The path crosses Sugarland Run on a series of columns. The path crosses a smaller stream on another series of columns. An asphalt trail intersects from the left. Continue on the present path. An asphalt trail intersects from the left. Continue to the right on the present path. On your next walk along this route you might turn left at this point and take this trail to Creekbend Drive. Turn right at the sidewalk there and follow it back to the starting point on Walnut Branch Rd. The short section of asphalt to the right also is the starting point for a natural surface trail that connects to the rock crossing of Sugarland Run. You can view a beaver dam on the left at the end of this short section of trail. Return to the asphalt trail when done. An asphalt trail intersects from the right. Continue straight on the present trail. The intersection with the road just ahead marks the starting point for this walk.